Today I’m going to give you my killer financial projections slide for your pitch deck. It’s exactly what investors want to see. Even if you’re not raising money, it’s important to get in the habit of creating and sticking to a budget for your company. Wait, you say you’re working on your product for the next few months? It’s important to start thinking about cash management now. You’ll thank yourself later for being prepared before things start moving more quickly. The first time I sat down to write out my business plan (yes I’m that old lol) I didn’t know how to do the “Pro Forma Financial Projections” so I just left it out. I didn’t even know what “Pro Forma” meant. Since then I’ve helped raise millions of dollars for both my own and other founders’ startups. I’ve put together a ton of pitch decks — and I’ve reviewed thousands more. In this article I’ll make it easy for you to create killer financial projections by sharing what I’ve learned. 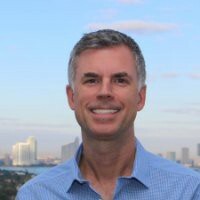 Check out my free mini-course on financial modeling for a great walkthrough! Oh, and in the startup world, “Pro Forma Financials” mean forward-looking financials based on assumptions. They’re your best estimate of your future results. Indeed, writing, when it first developed in ancient Sumer, was invented for financial contracting and accounting. Some of the entrepreneurs I talk to are great with numbers. This is always refreshing, and it gives me confidence in their ability to execute. Other entrepreneurs either don’t how to create a financial model or they don’t know how to present their projections in the pitch deck. It’s crucial for founders to either understand their numbers or find a co-founder who does (and even then you’ll want to learn what’s going on). I’ll give you my favorite financial slide template for your pitch deck. 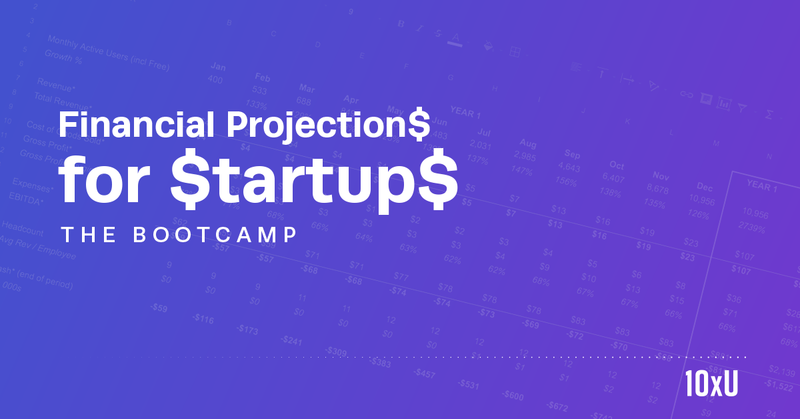 I’m hosting a Financial Projections Bootcamp on Wednesday, 9/13 to teach you everything you need to know about your startup financials. Some founders push back that this looks too complicated, but I find it’s exactly what investors want to see. If you insist on having something simpler in your pitch deck then make sure you have this ready in the appendix if someone asks. Yes we all understand that these financial projections are a guess. It’s important, however, that they’re your best guess. Your job as an entrepreneur is to make your best prediction…and then go out into the world and prove yourself either right or wrong. Then come back and update your best guess based on what you’ve learned. Take the time to put something together that you think can work. Don’t worry that it’s not perfect. You’ll improve it as you move forward, both from what you learn as you try to hit your numbers and from the feedback you receive from investors. I was talking to an entrepreneur today who said he was embarrassed by the first financial projections he put together. I told him that’s what’s supposed to happen. We all learn by doing so just get started. Keep at it, ask for help, and don’t get discouraged. It took me a few tries and several years before I truly started understanding financial projections (and that was while I was already running my startup). But don’t worry because I’m giving you a huge head start. How Do I Make Money and How Much Does It Cost Me? These are the two main questions in every investors mind, and this slide tells them exactly what to expect. It’s important to break out the first year by months. I’ve tried doing it by quarter instead and I always get complaints from investors. I show three years total, with the first year both broken out by month and show in summary. Years 2 and 3 are only shown in summary. I also show the revenue numbers in thousands, because hopefully I’ll be generating enough revenue that all of the zeros will make my financial projections look crowded. All this means is that I divide the dollar amounts by 1000-so $6,000 becomes $6 and $23,000,000 becomes $23,000. I find that financial projections work best when constructed as an income statement (also called a profit and loss statement) with a little bit of extra info at the top (number of units sold) and bottom (cash flow). Investors are looking to sanity-check what the entrepreneur is telling them, so we’ll give them enough info to do this at a glance. It’s best for both your startup and your investors if you err on the conservative side, so that any surprised happen on the up-side rather than the down-side. Like when you underestimate your revenue and overestimate your expenses. The basic formula is Total Revenue minus Cost of Sales (COGS) equals Gross Profit. From here, Gross Margin % equals Gross Profit divided by Total Revenue. Subtract Operating Expenses (Sales & Marketing plus Research & Development plus General & Administrative) from Gross Profit to arrive at EBIT (you can probably also call this EBITDA in your startup). The key is to provide enough detail that investors can understand your business model, but not so much detail that the slide becomes confusing. If an investor is interested you’ll have the opportunity to provide more detail, so don’t worry too much if you’re leaving some of the complexity of your business model out of this top-level slide. For example, if you’re selling an IoT (Internet of Things) product like the Nest Camera you might have revenue streams from both unit sales and monthly subscriptions. 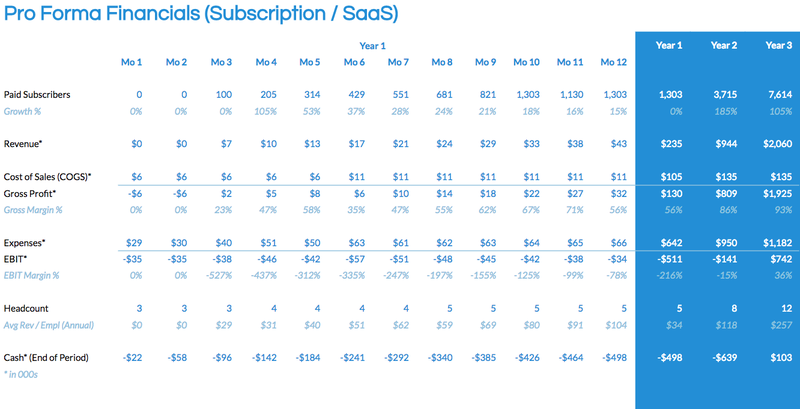 You could combine both into a single “Revenue” line and then either break key metrics out separately in a separate slide or be ready to give investors the breakdown if they ask. This should be whatever your key metric is that drives revenue growth. This goal is to give investors a quick glance at how many subscriptions, products, or services are you planning to sell. You’ll want to tailor this to your business model. In this case we’re using Paid Subscribers, since that’s the key revenue driver for this startup. If you’re not going to have revenue for a while then this should be the key metric that drives the eventual success of your business — which in Facebook’s case might be Daily Active Users. Or if you’re selling physical goods you might use Units Sold. We also recommend including a line for Growth % to show how quickly your sales will ramp. Investors can use these numbers to sanity-check your projections, especially if they know your industry well. This tells investors how quickly revenue will grow, which may be different from how many units are being sold. Revenue is a key driver for the income statement, and every business must eventually make money in order to survive. It’s okay to combine multiple revenue streams into a single line here. You can always dive into a detailed breakdown for anyone who’s interested. Continue reading and grab the slide template at 10xU.com. Originally published at 10xu.com on August 25, 2017. Calling all entrepreneurs! 10xU gives you the roadmap to build a killer startup — based on real-world experience building over 40 companies at Rokk3r Labs.